Clouds from the off shore frontal system are streaming over Northern California. Cloudy today with scattered light showers north of a line from Ukiah to Red Bluff to Mt Lassen with a few sprinkles south of the line. 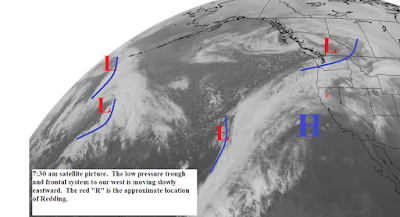 The next frontal system will reach the coast tonight and spread rain over the area Sunday. Snow level will lower to 3500 feet north and 4500 feet south by afternoon. Gusty south winds will precede this system. The precipitation ends Monday morning and skies will be clearing. Tuesday through next weekend a high pressure ridge will be along the coast (see map below). The north state will be mostly sunny with above normal daytime temperatures and periods of gusty north winds.